As some of you may have read, I celebrated a milestone birthday last week. Yep, fifty years old already. Which surprises me somewhat, because I can still remember what 10 felt like. And 24. Can anyone relate? And while I have gotten considerably wiser and certainly more knowledgeable about a lot of things, 10 and 24 just don’t seem that long ago. When I was 24 years old, more than a quarter of a century ago, we lived in Abu Dhabi and being back here and reconnecting with yet another old friend has freshened those memories enormously! Those days, we spent every weekend with David, eating curry suppers after a rousing game of Pass the Pigs and a few cold beers on a Thursday night, cooking full English breakfasts (often at four or five a.m.), attending marathon “company” lunches that lasted from lunchtime through to early evening, but most especially, we sailed all day Friday and sometimes Saturday as well. We had a Prindle catamaran and David sailed a wooden single hull boat called a Drascombe Lugger. Along with a few other friends, we would launch our crafts in the morning, sailing out to some of the sandy spits offshore Abu Dhabi, bringing along drinks and sausages to grill. We had fabulous weekends! So guess what we did for my birthday? We went to Abu Dhabi, of course! First there was a fun champagne tasting and dinner at David’s on my actual birthday evening. Then we sailed all the next day, sipping cold wine and eating hot sausages in buns. And then Saturday night we enjoyed a wonderful dinner out that started with champagne and included a specially chosen wine with each delicious course. All in all, a great birthday weekend adding to great memories with a dear friend. so you have to plan your lunch stop wisely. 1. Your real friends don’t change and it doesn’t matter how often you get to see them, you will still love them and enjoy their company. And they will love you. 2. Friendships have a collective memory. What you don’t remember, someone else will and vice versa. Which is really important as we age. 3. Having a good giggle about old times reinforces the collective memory of all so we should get together with old friends more often. 4. When people are hurting, you should cook for them. Your time and concern nurture their souls and the food nurtures their bodies. 5. Sailing is one of the best ways to spend a day. 6. When you stay with people, you should bring them food, drink and/or flowers. 7. Love people like you’d like to be loved, because it’s the right thing to do. 8. Be loyal to your friends and they will be loyal in return. 9. The company of good friends makes good food and drink taste even better. In keeping with number six, I brought these tasty muffins to share for breakfast. 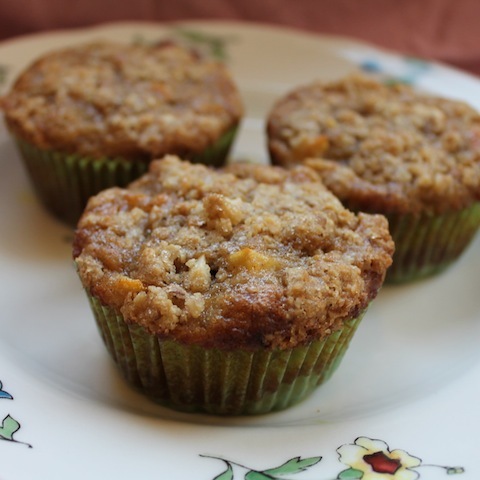 Our recipe this week was for a maple apple muffin, but I thought I’d make them an even more complete breakfast by adding bananas and grated carrot and then topping them with some crunchy granola. Perfect. 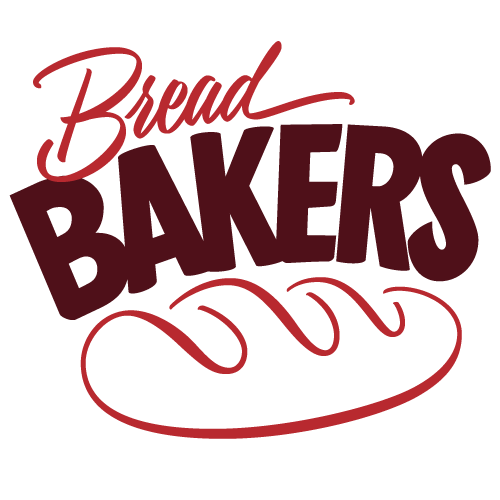 Preheat oven to 350°F or 180°C. Fill the muffin tin with liners or grease it really well with butter or non-stick spray. Measure your flour, brown sugar, baking powder and salt into a large mixing bowl and give them a good stir to mix. Cut chunks off of your banana and mash them with a fork into in a measuring cup. When the mashed banana hits 1/2 cup, eat what’s leftover, if any. In another smaller bowl, mix the egg, mashed banana, vanilla, honey and butter. Peel and grate your carrot and mix it into the liquids bowl. 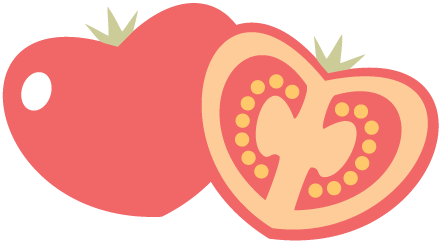 Peel and core your apple and cut it into little pieces. Add them to the liquids bowl as well and stir to coat. This will keep your apple from turning brown. Make your topping by crunching the granola into small pieces with the end of a thick wooden spoon. Add in the butter and stir and mash until it is combined. Add in the light brown sugar and mix well. Set aside. Complete the batter by pouring the liquid ingredients into the dry ones and fold until they are just combined. Use your fingers to sprinkle the topping on the batter. Allow to cool for a few minutes in the muffin tin and then remove to a rack to cool completely. Firstly, happiest belated birthday, Stacy! I can't believe I missed it. Hope this year is everything you want it to be and more. Sounds like you had a super fun birthday! Sailing, sipping on wine sounds like my ideal day. Thank you, Anuradha! It was a great weekend of good food, good drink and lots of reminiscing! Plus creating new memories. These muffins traveled well and I do believe they make a good breakfast that will hold off the hunger till lunchtime. 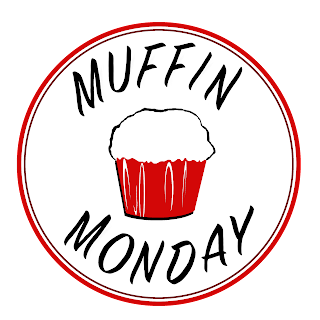 Happy #MuffinMonday to you too! Happy belated birthday!! Sounds like it was absolutely wonderful. Dubai is gorgeous!! I love when you post pictures of where you live. Oh and these muffins sound divine. I love the pairing of apples and carrots. Lovely! Thanks, Kate! 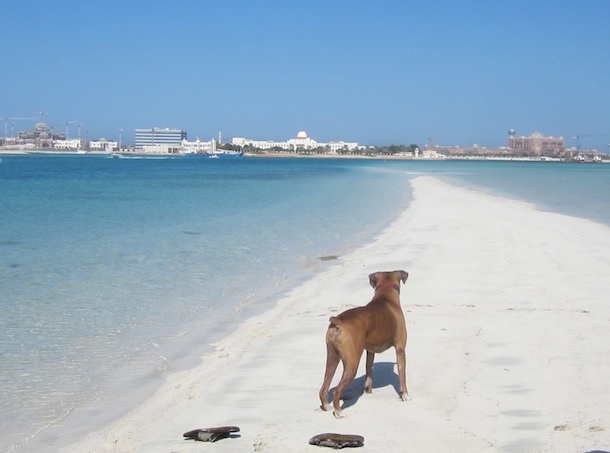 The photo is actually offshore Abu Dhabi, which is more beautiful than Dubai, for my money. But I guess I really shouldn't say that, since I haven't sailed out of Dubai yet. We are looking to buy another small boat here so I'll post photos if we do. Happy Birthday! The muffins look so lovely - and I love the things you learned in 50 years!! Thank you, Jasmine! And you are right: the banana was great for making them moist and offered a nice background flavor to the apple and carrot. Happy belated birthday! These muffins look so good; I love the flavor combo. Thank you, Lyn! Birthdays were always a big deal in our family so, while we don't have to do something big, the event should be special. How does 50 feel? No different right? Ha, ha! 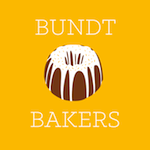 Well, I came upon your blog looking for apple, banana and carrot muffins. This recipe is awesome! I didn't have granola or muesli for the topping, so I used oatmeal. 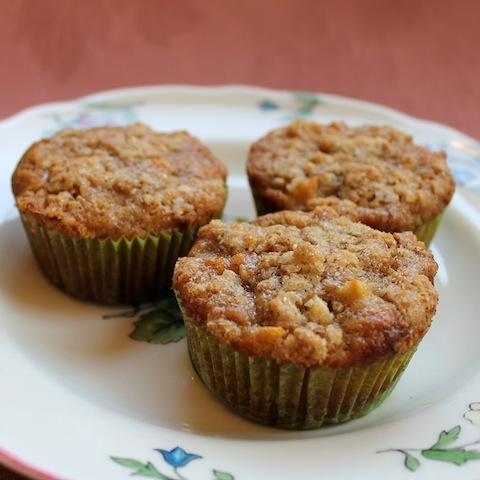 I also grated the carrots and apple, but they are such tasty muffins. It's a nice switch from plain banana muffins. Thanks for posting. PS I have to ask, how did you end up living in all those different locations? Wow!